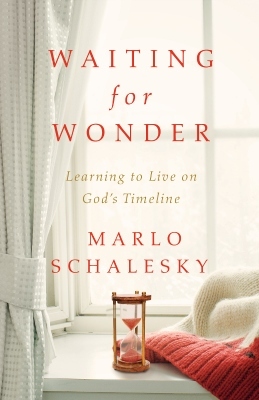 This is the question at the heart of Marlo Schalesky's new book, Waiting for Wonder: Learning to Live on God's Timeline. I confess, when I first read the title I wasn't sure I wanted to delve into the topic of waiting. Waiting is hard and it takes intentional soul work (and a whole lot of prayer!) to wait well. We all tend to start out waiting well-- with hope, grounded in our faith, with expectation for God to meet us in our place of need and answer our questions, our prayers, to bring our dreams to life. We like to think we are o.k. with God's timeline, but when days turn into weeks, which turn into months, which turn into years...sometimes many years...do we still wait well? 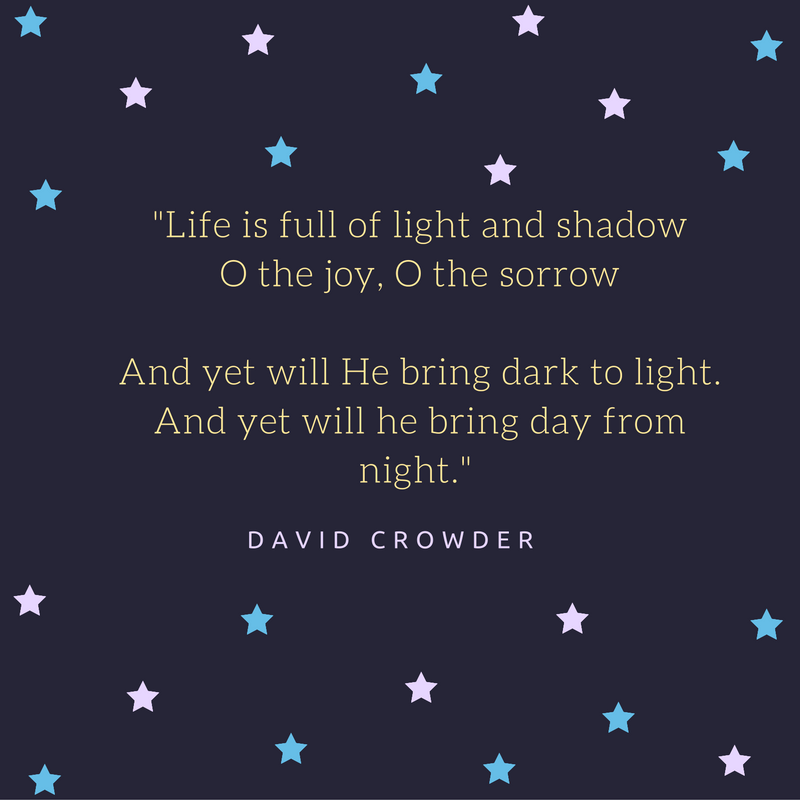 Or, do we become discouraged? Perhaps you are waiting for healing, or a baby, for a dream to come to fruition, for family reconciliation, for your financial situation to change, or for a breakthrough for a beloved family member who is lost and in need a hope themselves...the list of things that we can find ourselves waiting for is long and varied. Waiting with hope is a God-centered place to be, it's where we all want to be, but often not where we find ourselves. It's easy to believe God when a promise is new. It’s hard when the years pass and nothing changes. It’s even harder when desperation strikes, your plans backfire, and still God does not fill the emptiness. But what if, in this waiting, God is calling us to more? Walking through the life of the biblical character Sarah, one who knows what it means to wait, you will discover a glimpse of God’s character that will give you strength to keep hoping and praying for the desires of your heart. The book examines the lives of Sarah and Abraham in their decades long wait for a son-- a son promised by God! When their own waiting turns to fear and fretfulness, all sorts of unfortunate decisions take place, including Sarah (then Sarai) giving her maidservant to her husband to bear a child (a common practice in that day, but far from what God had planned), and eventually becoming bitter towards her maidservant for what she (Sarai) had chosen. While I have heard this story countless times, Schalesky offers a fresh, and perhaps more personal perspective, than I had heard or read before. It's a perspective that takes Sarah's longing for a baby and makes it more universal for those of us who have different longings, that inevitably can lead to the same crises moments in our faith. By the time I finished the book I felt encouraged and reminded that longing, and fear, are a normal part of the human condition. That we are not alone in our internal questions and wrestling, and that God blesses, forgives and redeems our lives even when we make a mess out of our waiting. "God's delight has always been the full, true, complete redemption of the things in our lives that we hate the most, the things that cause the deepest sorrow, the worst guilt, the most agonizing pain. Those are the very things God longs to transform--for Sarah and for us." "I want to believe that when God calls, the journey will be straight, unhindered and without delays. There will be no stuck-halfway, no settling in the in-between places where the past is behind yet the promises of God still seem distant. But I don't always get what I want. In Sarai's story, or in my own"
"Sometimes life doesn't turn out the way you planned. In fact, it rarely turns out that way. So often we stand hurt and frustrated as our carefully constructed plans are crushed into find sand, running through our fingers. Where is God then? Whom do we turn to? How do we trust? And what does it mean to leave the broken parts of life in the hands of our God?" "God gives you your true name. He knows it and declares it. He tells us who we are. Not our failures, not our faults, not our mess-ups, not our spouses, not our friends, not our enemies--none of these define us. We are who God says we are." "Sometimes when God is saying to us, "Almost, but not yet, not quite yet" he is not simply extending our pain. Instead he is cleansing us. He is setting us free from patterns, entanglements, and sins we don't even see to become who we are meant to be." Definitely consider picking up a copy of this book. It will encourage and refresh your soul. It will water the dry places of waiting and renew your hope. It will help you to wait well, whatever waiting looks like in your life. You can pick up a copy on Amazon, by clicking here. Marlo Schalesky is an award-winning author of 10 books, including both fiction and non-fiction. Her novels have garnered the high honors of the Christy Award and ACFW Book of the Year. Schalesky’s non-fiction releases include Wrestling with Wonder: A Transformational Journey through the Life of Mary (Zondervan) and the latest, Waiting for Wonder: Learning to Live on God’s Timetable(Abingdon Press). More than 1,000 of Schalesky’s articles have been published in various Christian magazines, including Focus on the Family, Today’s Christian Woman and In Touch. She has contributed devotional books for couples and children. 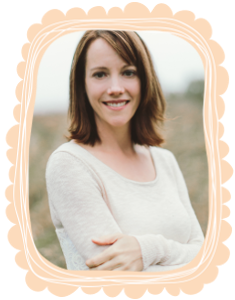 She is a speaker and regular columnist for David C Cook’s Power for Living. Schalesky is a graduate of Stanford University and has earned her Master’s in Theology, with an emphasis in Biblical Studies, from Fuller Theological Seminary. She is the founder and president of Wonder Wood Ranch, a California charitable organization bringing hope to a hurting community through horses. Schalesky lives with her husband, six children and a crazy number of animals at her log-home ranch on California’s central coast. *** I received a complimentary copy of this book from Litfuse Publicity in exchange for an honest review. Do you ever struggle to know how to pray? How to go deeper or make things feel fresher? How to connect with God in a more personal way that doesn't feel rote or repetitive, small or self-focused? I know I do. I pray daily. I pray throughout the day. Many days 'pray without ceasing' feels like the lifeline that gets me through the ups and downs of the normal day-to-day stuff. But, despite my persistence and intentional efforts to talk to God on a regular basis, I can't help feeling at times that my perspective feels small and my scope skewed. That in the midst of a season of life where I can get so focused on the needs of my kids, the mess in my house, and the rotisserie chicken that needs to be picked up for dinner, that my prayers sometimes feel trite. While God promises to hear and respond to our smallest needs, I do believe He'd like us to think bigger...or, at least PRAY bigger. Prayer is powerful and God has placed us in community in order to lift each another up, to carry each other's burdens, to pray diligently for one another. This book, Pray A to Z: A Practical Guide to Pray for Your Community, will help you to do all of that on a very practical level. Devoting 5 distinctive topics to each letter of the alphabet Rhodes manages to paint a big picture of the world and its needs...130 of them specifically. The beauty of this book, at least for me, is that even though there are 130 topics listed, the scriptures she pairs with each topic, and the questions she asks, led me to think about things far beyond the topics on the page. Rhodes prompts us to see this book as a "conversation starter" with God. I believe she has succeeded in creating a book that fulfills that purpose. I'm looking forward to using this book on a regular basis as a practical way to expand my conversations with God. "If only an audible alarm could jolt us out of our spiritual slumber every day and call us into prayerful action for our community," Rhodes says in her introduction. "How would our communities change if we didn't just say "I'll pray for you," be we actually did pray-- deeply, intensely, and purposefully." I'd like to know the answer to that question, wouldn't you? How would our collective communities look different if we really took the time to intentionally pray for them. As I read through the topics this first time around I was convicted by the number of things I hadn't been praying for...Adoption, Homelessness, Job Seekers, Law Enforcement, Addictions, Refugees, just to name a few. These topics can sometimes feel overwhelming-- where does one even start when praying for "hunger", for example? This book is a solution to that challenge. It kick-starts the prayer dialogue. I encourage you to pick up a copy. Leave it next to your nightstand and pray through one topic a night. Read through the book and pick a handful of topics to pray about with your kids. Stick it in your car and pray for your community while your waiting in the pick-up line at school or one of your kids sports practices. There are dozens of great ways to use this book as tool in your family's prayer life. As the book so aptly lists under the letter "O"... it is in our "ordinary" lives that we are called to pray extraordinary prayers. Let's get started! Check out the links below to be entered to win the Pray A to Z prize pack! 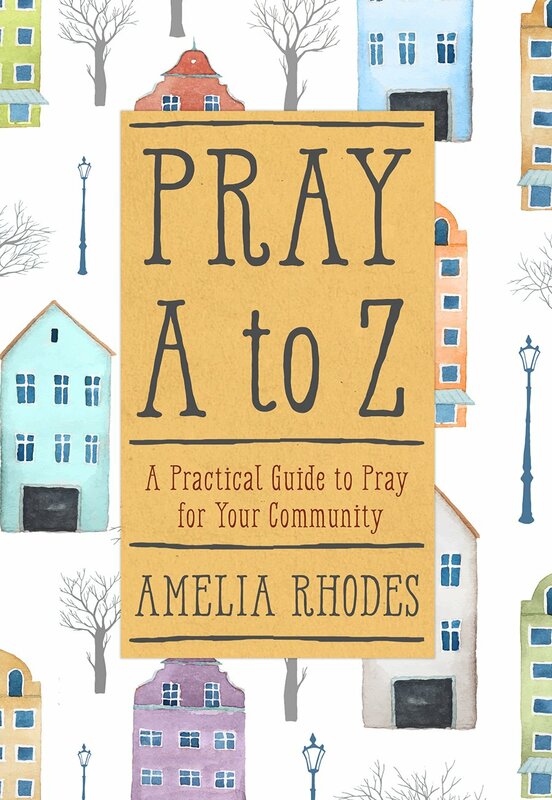 Learn more about Pray A to Z and how to pray for your community, and enter to win Amelia’s Guide to Prayer Prize Pack to get you started. Enter today by clicking the icon below, but hurry! The giveaway ends on December 20. The winner will be announced December 21 on Amelia’s blog. 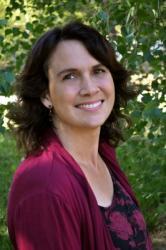 Amelia Rhodes is an author, speaker and self-proclaimed recovering perfectionist. She has a passion for taking the everyday stories of life and connecting them with God’s truths. Having been freed from the grip of perpetual anxiety, Rhodes has a growing speaking ministry through which she encourages women to discover who they are in Christ and to deepen their relationships with one another. Rhodes has written for several publications including The Upper Room and four Chicken Soup for the Soul books. She is the author of Isn’t It Time for a Coffee Break?, offering a fresh perspective on women’s relationships. 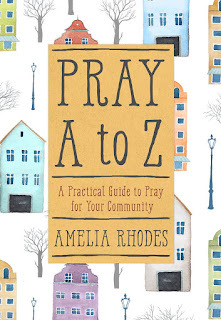 Her latest release, Pray A to Z: A Practical Guide to Pray for Your Community, helps readers topically organize their prayer requests and lay the burdens of the community at the feet of our Heavenly Father. 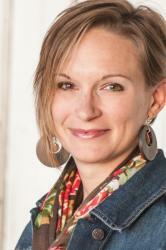 Rhodes lives in Michigan with her husband and two children. Connect with Rhodes at ameliarhodes.com, on Facebook(ameliarhodeswriter) and via Twitter (@amrhodes). *** I received a complimentary copy of this book for review purposes. The thoughts and opinions are my own. NyQuil, Jesus, and a Treadmill: Read This Post on Really Bad Days! The title of this post is a reminder to myself..."Read this post on really bad days!" Do you ever think about writing yourself a manifesto to read on the days when your brain spirals downward into the blah blah discouragement dumps? This is that post. The post that reminds me to turn to Jesus, quickly! The post that reminds me where my feet need to be planted. The truth is, no matter how much spiritual healing and deep soul work I do, I will still have crummy brain days...days when the truth gets blurred and my heart sinks low. But, my recovery (because of the healing I've done!) is so much faster these days. I wrote this post in case you, like me, are having a bad day...even in a sunny place like Florida, and need a little pep talk to pull yourself out of it. 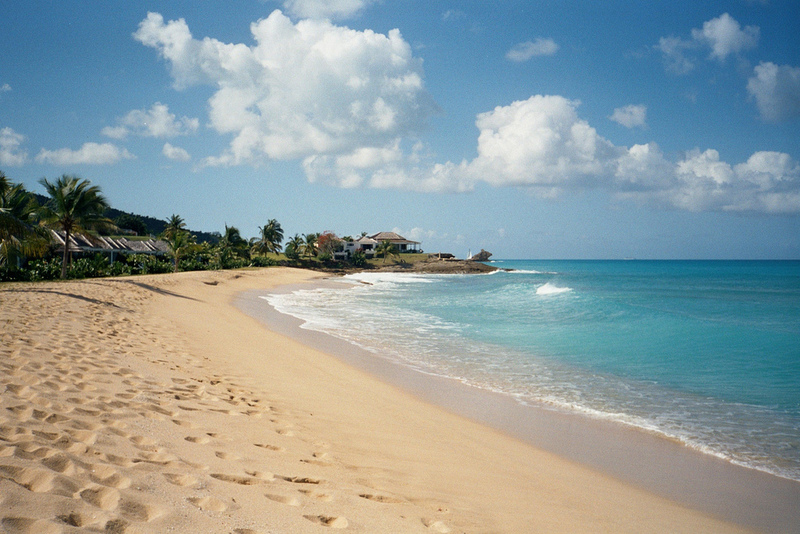 I'm a lucky lady...I got to sneak away for a couple days of quiet and sunshine this week. I was looking forward to it, and then felt guilty about it, and then I embraced it and got on the plane to Florida with Scott (who had to go for business reasons) earlier this week. 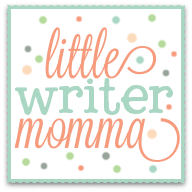 I brought a bag full of journals, books, blog post ideas, freelance work I needed to do, to-do lists, shopping lists...all of those things that often get pushed aside until the "after hours" when the kids are in bed. Lately, the "after hours" find me so tired that I sit on the couch for just "one minute", close my eyes, open them long enough to muster up the energy to make sure the dishwasher is loaded and then head to bed where I try to read a chapter in a book and end up falling asleep a page and a half in. This is motherhood in all of its tired glory in these early years. Maybe in all the years...I don't know. I can only speak to the reality that I know now. The "after hours" have been the tired hours lately. Hours I dream about all day. Hours I promise myself will be full of the writing I've wanted to do, and organization projects, and Shutterfly photo books. Then I actually reach 9 p.m. and its like all of those ideas were little mirages in the hot and sandy motherhood desert. It's all good. I know this "desert" is a season, and there is much beauty within it. Our trip started with a zing when our original 9:50 a.m. flight got cancelled, and a Southwest agent asked us at 7:15 a.m. if we could make an 8:20 flight-- all while Aubrey was clinging to my leg and crying for me not to leave, Ava's bus was pulling down the street, and Ella was still sleeping. Regardless, since our bags were mostly packed, we flew out of the house after Ava got on the bus-- with Aubrey (who was starting to settle down), a sleepy Ella, our luggage, and Scott's mom (baby sitter extraordinaire!) in tow, and somehow made it to the gate for that 8:20 Florida flight on time. I looked like an actress from one of those zombie shows: Crazy hair, no make-up, one earring on because the other one broke in the car, pale from lack of sunshine, and yet to be caffeinated because we ran out the door so quickly. After all the running, I did get a coffee right before we boarded and the 2 1/2 hour flight. And since we were flying sans kiddos I actually finished a book I've been trying to finish for almost a year...a book on ADD, nonetheless. It's ok, you can laugh. I've recently been trying to decipher whether I've always had underlying ADD or if I've just gone gone MADD (Motherhood Attention Deficit Disorder). Either way, the book gave me all sorts of great ideas for organizing my life and helping me to focus. I wrote them all down on a piece of paper that I probably won't be able to find by next week. It has been a nice week...really, it has. I got to visit Scott's cousin Tyson, his beautiful wife and adorable 8 month old son in their home in Tampa. Ty and Meg are two of my favorite people in the whole wide world...they run a non-profit called New Perspective Foundation that offers financial aid to families who have experienced a spinal cord injury. You can read more about Ty and Meg and what they are doing on their website. You will absolutely be inspired. I didn't get a picture this time around, but this is Ty, Meg, their baby and Aubrey at Cedar Pointe earlier this year. I also got to visit one of my grandmother's best friend's in Daytona. My grandmother died at the far too young age of 64 from lung cancer (after years of heavy smoking). Visiting her friend (they were friends for over 40 years!) was like vicariously getting to connect with a piece of her for a few hours. It was a sweet time. I sat at her kitchen table with her and her husband (she's almost 80 and he's 88) and listened to them talk about life--their card playing nights, her husband's jam sessions on Thursday nights with a couple of other local musician (he played and sang in small, local country music bands for most of his life and music is still the thing that makes his face light up! ), and sadly their experiences with the death's of many friends and illnesses that pervade when your social circle reaches the age of 80+. It was a humbling, heart warming reminder about how quickly life marches forward, and how fleeting the days can be. I made a 15 minute pit-stop to see the Atlantic Ocean while in Daytona, took a picture of my toes in the sand, the waves behind me, and collected a pocketful of shells for my girls. I did momentarily wonder, as I stared at the many folks jogging and walking down the beach that morning, and gazed up at the towering condo complex that sat on the beaches edge, how it might change someone's (ahem, mine!) daily emotional make-up to gaze out a window every morning and see something as majestic as the ocean. But for now, I live in Buffalo. Grow where you're planted, right?!! (Which reminds me of the beautiful, flowering hibiscus plant that I bought myself for Mother's Day. It's currently struggling to bloom in the back of my living room under the gray shroud of a Buffalo November...need I mention how tall and full of flowers the hibiscus plants are down here?! I think there's a lesson in that, but I'll save that for another post!). So those were all the great moments on my little trip. For better or worse, despite the sunshine and quiet trips in the car, I seemed to have brought an increasingly annoying head cold with me from Buffalo. I tried a couple shots of nose spray, Tylenol, lots of water and Emergen-C. But by Wednesday night my head felt so spacey and my nose so stuffy that I gave in and took a full dose of NyQuil. I'm pretty sure that was a bad idea (and now remember why I don't take the stuff!). The upside- I slept really well and my nose felt a little bit better in the morning. The downside- I woke up with a wicked NyQuil hangover. Tired, spacey, struggling to focus. I actually felt like a hot mess yesterday morning. I was anxious about things I hadn't gotten done yet that were on my Florida "to-do" list. I was feeling anxious about life in general-- about goals I've set for myself that I've struggled to reach, about things I want to do with the kids that I struggle to fit in, about all sorts of things that are too many to fit into this small blog space and would make this post more tedious than it needs to be. Simply stated, I was a mess. And then I was mad at myself for being a mess. I shouldn't be a mess here. Not in Florida! Not in a quiet hotel room. Not with the sun shining. Not with Nanner (grandma) so selflessly watching the kids for 5 days. I have NOTHING to be a mess about. The hilarious Seinfeld-ish part of the day was that in the midst of my sinus induced, NyQuil provoked haze, as I was trying to pull myself together with water, coffee and lots of prayer, I went over to open up the curtains and sliding glass door to get some fresh air and was greeted by more than fifty 13-year old girls, from several cheerleading squads, all practicing for a large cheerleading competition that takes place in Orlando this weekend. The cheerleaders took over the hotel. Seriously. There were like 500 of them here by the end of the day. It was painfully hilarious to this tired, anxious mom looking for some quiet! I texted my mother-in-law who rightfully told me to find some ice cream, because it makes everything better. As lovely as the sun felt on my face and legs, as good as that sandwich was, and as beautiful as the hotel and pool were, I couldn't untie the tangled web of discouragement that was hovering over my mind. I did read my magazines-- that was nice. I read through some chapters of a friend's memoir, which was also nice. I stuck my feet in the pool. I closed my eyes. 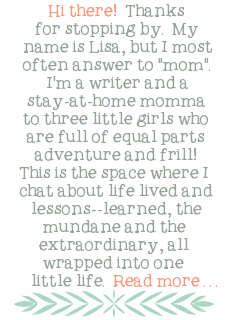 Perhaps it takes weeks to find a restful place in a mother's mind? I thought to myself. Perhaps this is as good as it gets. Later in the day I stopped at the hotel coffee shop and got a vanilla latte, and found a quiet-ish (as quiet a corner as I could in a hotel teeming with cheerleaders) spot where I sat and started this blog post. It felt good to sit down and throw words onto the computer-- to share my heart, to be honest about my day. I realized that in my tired haze lately, there hasn't been much time for this; blogging, journaling, sharing. But then I made my way upstairs to our room, where I saw Scott for a few minutes in-between meetings. (We haven't actually seen much of each other this week.) I was going to go for a walk and couldn't find my sports bra, and then couldn't find my tank top, and then couldn't find the ear buds for my phone and in the midst of searching and throwing clothes around like confetti, I lost it a little. You know, a mom meltdown. I started crying and ranting about all of the yadda, yadda going on in my head. I had considered writing a laundry list of all of the things I was pondering, but here's the reality, we all have our "stuff". The things that trip us up, the lies we start to believe about ourselves. I'll be honest about a few things-- I've struggled with anxiety issues for the better part of my adult life. Sometimes the fact that life, and all of life's details overwhelm me so intensely, can cause the anxiety to turn into subtle depression. I've done reading on high sensitivity, anxiety, and ADD-- there are many pieces of the literature about all of these things that absolutely ring true for me. I've prayed about it. I've talked to counselors, psychiatrists, coaches, mentors, teachers...you name it. I come from a long line of family issues- depression, anxiety, hoarding, suicide, alcoholism- there are a lot of stories to tell. Jesus is bigger than all if it. I say that with full confidence, from the bottom of my heart, from the deepest depths of my soul. Though my emotional landscape has been a journey of discovery, with many ups and downs, particularly over the last 15 years (there is much to the story, I assure you! ), I feel more grounded in my faith than ever before, and on my worst emotional days my ability to hear God's voice in the midst of the fog is greater than ever before. So, even though the day started out on a rocky note, this is what inevitably happened. I prayed, opened my Bible and God showed up. Give me a verse God, a word. I need to hear YOU right now! God's word does not return void. Ever. I opened to Ezekiel 34:12, "As a shepherd seeks out his flock in the day that his sheep are scattered; so will I seek out my sheep, and will DELIVER them out of ALL the places where they have been SCATTERED in the cloudy and dark day." My mind felt cloudy. Dark. Scattered. I was feeling lost and in need of someone to guide the way. The reality is that my family history, the story of how I came to be, is a scattered story too...sheep scattered in dark places. He seeks us out. 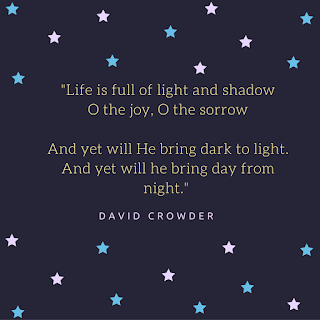 He finds us in our dark places. He calls to us and delivers us. There is freedom when we come to Him. I eventually found my headphones (well, actually Scott found my headphones in the suitcase I had searched 3 times) and made my way down to the hotel fitness center where I hopped on the treadmill ready to pound out my discouragement and heavy heart. I was a totally changed woman when I got off the treadmill last night. I felt stronger. Braver. My hope was restored, my clarity was restored. I felt encouraged, emboldened, hopeful. That is the power of the holy spirit that lives in us when we have a relationship with Jesus. Truly. You can't make this stuff up. I was reminded that my mind falls in slippery, shadowy places because I am oh so human. Perhaps it's genetics, biochemistry, hereditary or situational. Perhaps I could pray more or more intentionally focus on all that I have to be grateful for. Perhaps. But, perhaps this is just part of who I am. I'm creative. Intuitive. Sensitive. Emotional. Those are all very good things, but in this crazy, hazy world my sensitivity can leave me overwhelmed, which leads to discouragement and fear. It is then that my mind gets foggy and I lose sight of Jesus. In the fear, I lose sight. I get lost. I wander. Fortunately, the good shepherd doesn't lose sight of me. He meets me where I am, often on the treadmill, and sets me back on solid ground. So, I'm leaving Florida a more peaceful woman. Not because of a massage or pedicure (which I actually didn't get). Not because of the sunshine (which was fantastic) or because of hours by the pool. Not because of some preconceived idea of rest in a quiet hotel room. But, because Jesus met me in my shadow-y place and reminded me that my peace is in Him.